24 January 2018: A new national facility at ESO’s La Silla Observatory has successfully made its first observations. The ExTrA telescopes will search for and study Earth-sized planets orbiting nearby red dwarf stars. ExTrA’s novel design allows for much improved sensitivity compared to previous searches. Astronomers now have a powerful new tool to help in the search for potentially habitable worlds. 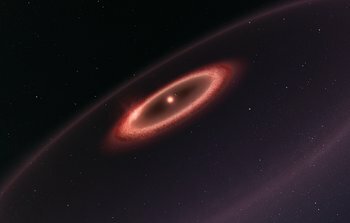 3 November 2017: The ALMA Observatory in Chile has detected dust around the closest star to the Solar System, Proxima Centauri. 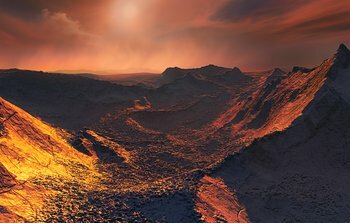 These new observations reveal the glow coming from cold dust in a region between one to four times as far from Proxima Centauri as the Earth is from the Sun. The data also hint at the presence of an even cooler outer dust belt and may indicate the presence of an elaborate planetary system. These structures are similar to the much larger belts in the Solar System and are also expected to be made from particles of rock and ice that failed to form planets. 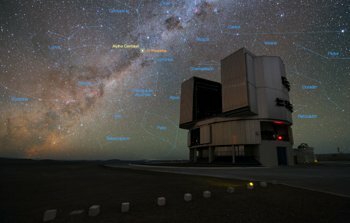 9 January 2017: ESO has signed an agreement with the Breakthrough Initiatives to adapt the Very Large Telescope instrumentation in Chile to conduct a search for planets in the nearby star system Alpha Centauri. Such planets could be the targets for an eventual launch of miniature space probes by the Breakthrough Starshot initiative. 9 May 2012: A new image of Messier 55 from ESO's VISTA infrared survey telescope shows tens of thousands of stars crowded together like a swarm of bees. Besides being packed into a relatively small space, these stars are also among the oldest in the Universe. 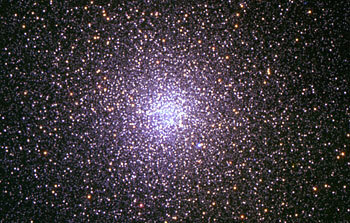 Astronomers study Messier 55 and other ancient objects like it, called globular clusters, to learn how galaxies evolve and stars age. 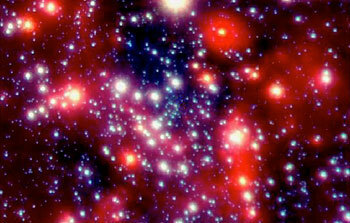 13 March 2007: Images made with ESO's New Technology Telescope at La Silla by a team of German astronomers reveal a rich circular cluster of stars in the inner parts of our Galaxy. Located 30,000 light-years away, this previously unknown closely-packed group of about 100,000 stars is most likely a new globular cluster. 8 June 2006: The Southern constellation Tucana (the Toucan) is probably best known as the home of the Small Magellanic Cloud, one of the satellite galaxies of the Milky Way. 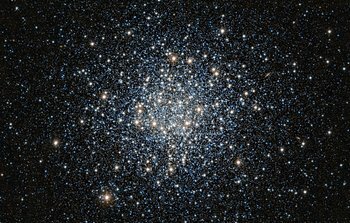 But Tucana also hosts another famous object that shines thousands of lights, like a magnificent, oversized diamond in the sky: the globular cluster 47 Tucanae. More popularly known as 47 Tuc, it is surpassed in size and brightness by only one other globular cluster, Omega Centauri. 17 October 2005: Near-infrared images of the active galaxy NGC 1097, obtained with the NACO adaptive optics instrument on ESO's Very Large Telescope, disclose with unprecedented detail a complex central network of filamentary structure spiralling down to the centre of the galaxy. These observations provide astronomers with new insights on how super-massive black holes lurking inside galaxies get fed. 22 March 2005: Super star clusters are groups of hundreds of thousands of very young stars packed into an unbelievably small volume. They represent the most extreme environments in which stars and planets can form. Until now, super star clusters were only known to exist very far away, mostly in pairs or groups of interacting galaxies. Now, however, a team of European astronomers  have used ESO's telescopes to uncover such a monster object within our own Galaxy, the Milky Way, almost, but not quite, in our own backyard! The newly found massive structure is hidden behind a large cloud of dust and gas and this is why it took so long to unveil its true nature. 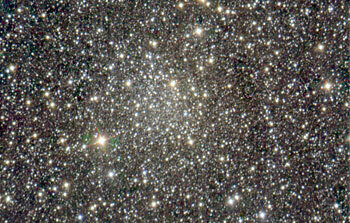 It is known as "Westerlund 1" and is a thousand times closer than any other super star cluster known so far. It is close enough that astronomers may now probe its structure in some detail. Westerlund 1 contains hundreds of very massive stars, some shining with a brilliance of almost one million suns and some two-thousand times larger than the Sun (as large as the orbit of Saturn)! Indeed, if the Sun were located at the heart of this remarkable cluster, our sky would be full of hundreds of stars as bright as the full Moon. Westerlund 1 is a most unique natural laboratory for the study of extreme stellar physics, helping astronomers to find out how the most massive stars in our Galaxy live and die. From their observations, the astronomers conclude that this extreme cluster most probably contains no less than 100,000 times the mass of the Sun, and all of its stars are located within a region less than 6 light-years across. 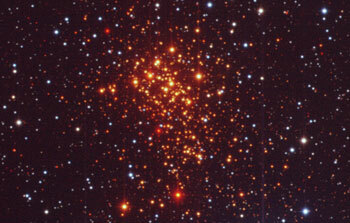 Westerlund 1 thus appears to be the most massive compact young cluster yet identified in the Milky Way Galaxy. 27 March 2003: The initial commissioning period of the new HARPS spectrograph (High Accuracy Radial Velocity Planet Searcher) of the 3.6-m telescope at the ESO La Silla Observatory has been successfully accomplished in the period February 11 - 27, 2003. This new instrument is optimized to detect planets in orbit around other stars ("exoplanets") by means of accurate (radial) velocity measurements with an unequalled precision of 1 meter per second . This high sensitivity makes it possible to detect variations in the motion of a star at this level, caused by the gravitational pull of one or more orbiting planets, even relatively small ones. "First Light" occurred on February 11, 2003, during the first night of tests. The instrument worked flawlessly and was fine-tuned during subsequent nights, achieving the predicted performance already during this first test run. The measurement of accurate stellar radial velocities is a very efficient way to search for planets around other stars. 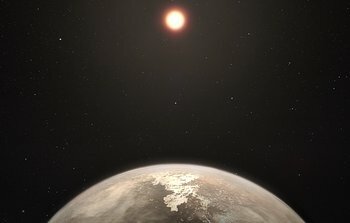 More than one hundred extrasolar planets have so far been detected , providing an increasingly clear picture of a great diversity of exoplanetary system. However, current technical limitations have so far prevented the discovery around solar-type stars of exoplanets that are much less massive than Saturn, the second-largest planet in the solar system. HARPS will break through this barrier and will carry this fundamental exploration towards detection of exoplanets with masses like Uranus and Neptune. 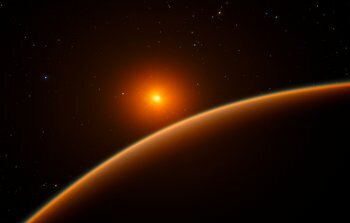 Moreover, in the case of low-mass stars - like Proxima Centauri - HARPS will have the unique capability to detect big "telluric" planets with only a few times the mass of the Earth. 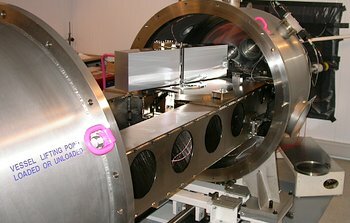 The HARPS instrument is being offered to the research community in the ESO member countries, already from October 2003. 15 March 2003: Observations with the Very Large Telescope Interferometer (VLTI) at the ESO Paranal Observatory (Chile) have provided the first-ever direct determination of the angular sizes of the disks of the solar-type stars Alpha Centauri A and Alpha Centauri B. 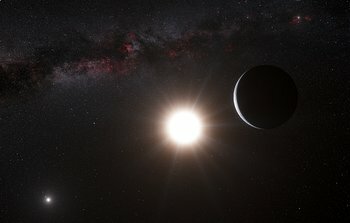 As the two largest members of this triple stellar system that also includes the much smaller Proxima Centauri, they are the Sun's nearest neighbours in space at a distance of just over 4 light-years. Together with photometric and asteroseismic observations, this fundamental measurement with the VLTI has lead to a complete characterization of Alpha Centauri A and Alpha Centauri B - they are now the "best known" stars. This has also allowed a unique and very detailed comparison between "real nature" and current stellar theory for solar-type stars. There is clearly very good agreement, indicating that the structure and evolution of stars like our Sun are well understood. The new observations of the nearest stars have therefore contributed to raise the astronomers' confidence in their solar models as well. We can now be more sure about the conditions inside the Sun, our central energy source, and also about the way it will change during the next hundreds of millions of years. 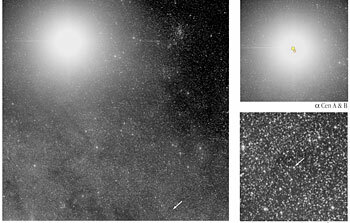 13 January 2003: A team of European astronomers ,  has discovered a Brown Dwarf object (a 'failed' star) less than 12 light-years from the Sun. It is the nearest yet known. 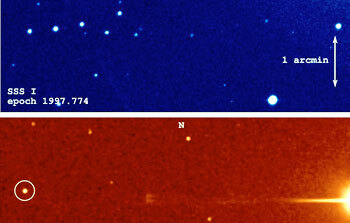 Now designated Epsilon Indi B, it is a companion to a well-known bright star in the southern sky, Epsilon Indi (now "Epsilon Indi A"), previously thought to be single. The binary system is one of the twenty nearest stellar systems to the Sun. The brown dwarf was discovered from the comparatively rapid motion across the sky which it shares with its brighter companion : the pair move a full lunar diameter in less than 400 years. 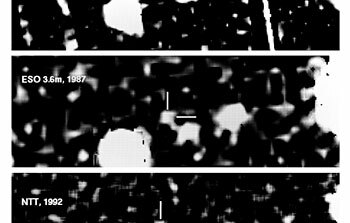 It was first identified using digitised archival photographic plates from the SuperCOSMOS Sky Surveys (SSS) and confirmed using data from the Two Micron All Sky Survey (2MASS). Follow-up observations with the near-infrared sensitive SOFI instrument on the ESO 3.5-m New Technology Telescope (NTT) at the La Silla Observatory confirmed its nature and has allowed measurements of its physical properties. Epsilon Indi B has a mass just 45 times that of Jupiter, the largest planet in the Solar System, and a surface temperature of only 1000 °C. It belongs to the so-called 'T dwarf' category of objects which straddle the domain between stars and giant planets. Epsilon Indi B is the nearest and brightest T dwarf known. Future studies of the new object promise to provide astronomers with important new clues as to the formation and evolution of these exotic celestial bodies, at the same time yielding interesting insights into the border zone between planets and stars. 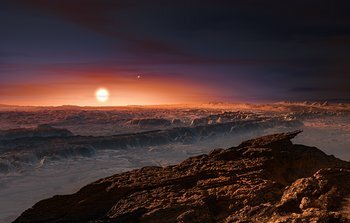 29 November 2002: At a distance of only 4.2 light-years, Proxima Centauri is the nearest star to the Sun currently known . It is visible as an 11-magnitude object in the southern constellation of Centaurus and is the faintest member of a triple system, together with Alpha Centauri, the brightest (double) star in this constellation. Proxima Centauri is a very-low-mass star, in fact barely massive enough to burn hydrogen to helium in its interior. It is about seven times smaller than the Sun, and the surface temperature is "only" about 3000 degrees, about half of that of our own star. Consequently, it is also much fainter - the intrinsic brightness is only 1/150th of that of our Sun. Low-mass stars are very interesting objects , also because the physical conditions in their interiors have much in common with those of giant planets, like Jupiter in our solar system. A determination of the sizes of the smallest stars has been impossible until now because of their general faintness and lack of adequate instrumentation. However, astronomers have long been keen to move forward in this direction, since such measurements would provide indirect, crucial information about the behaviour of matter under extreme conditions. When the first observations with the VLT Interferometer (VLTI), combining the light from two of the 8.2-m VLT Unit Telescopes (ANTU and MELIPAL), were made one year ago, interferometric measurements were also obtained of Proxima Centauri . They formed part of the VLTI commissioning and the data were soon released to the ESO community, cf. the special website. 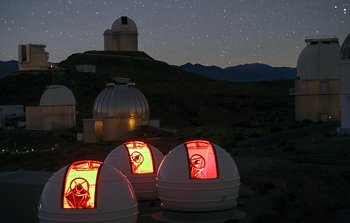 Now, an international team of astronomers from Switzerland, France and ESO/Chile has successfully analysed these observations by means of newly developed, advanced software. For the first time ever, they obtained a highly accurate measurement of the size of such a small star. Three other small stars were also measured and the results are in excellent agreement with stellar theory, indicating that our present understanding of the structure and composition of very small stars is reasonably correct . 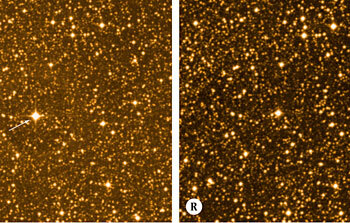 More VLTI observations are soon to follow, eventually also of even smaller objects, like Brown Dwarfs. 16 October 2002: An international team of astronomers , lead by researchers at the Max-Planck Institute for Extraterrestrial Physics (MPE) , has directly observed an otherwise normal star orbiting the supermassive black hole at the center of the Milky Way Galaxy. Ten years of painstaking measurements have been crowned by a series of unique images obtained by the Adaptive Optics (AO) NAOS-CONICA (NACO) instrument  on the 8.2-m VLT YEPUN telescope at the ESO Paranal Observatory. It turns out that earlier this year the star approached the central Black Hole to within 17 light-hours - only three times the distance between the Sun and planet Pluto - while travelling at no less than 5000 km/sec. 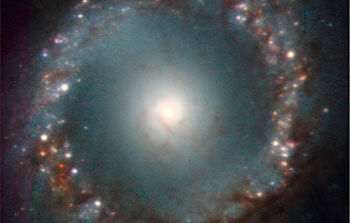 Previous measurements of the velocities of stars near the center of the Milky Way and variable X-ray emission from this area have provided the strongest evidence so far of the existence of a central Black Hole in our home galaxy and, implicitly, that the dark mass concentrations seen in many nuclei of other galaxies probably are also supermassive black holes. However, it has not yet been possible to exclude several alternative configurations. 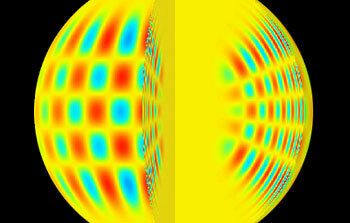 In a break-through paper appearing in the research journal Nature on October 17th, 2002, the present team reports their exciting results, including high-resolution images that allow tracing two-thirds of the orbit of a star designated "S2" . It is currently the closest observable star to the compact radio source and massive black hole candidate "SgrA*" ("Sagittarius A") at the very center of the Milky Way. The orbital period is just over 15 years. The new measurements exclude with high confidence that the central dark mass consists of a cluster of unusual stars or elementary particles, and leave little doubt of the presence of a supermassive black hole at the centre of the galaxy in which we live. 28 June 2001: Sound waves running through a star can help astronomers reveal its inner properties. This particular branch of modern astrophysics is known as "asteroseismology". In the case of our Sun, the brightest star in the sky, such waves have been observed since some time, and have greatly improved our knowledge about what is going on inside. However, because they are much fainter, it has turned out to be very difficult to detect similar waves in other stars. Nevertheless, tiny oscillations in a solar-twin star have now been unambiguously detected by Swiss astronomers François Bouchy and Fabien Carrier from the Geneva Observatory, using the CORALIE spectrometer on the Swiss 1.2-metre Leonard Euler telescope at the ESO La Silla Observatory. This telescope is mostly used for discovering exoplanets. The star Alpha Centauri A is the nearest star visible to the naked eye, at a distance of a little more than 4 light-years. The new measurements show that it pulsates with a 7-minute cycle, very similar to what is observed in the Sun.